Abby Rose, the V.P. of Fun, here at CraftSanity is turning 5 next week, so we’re crafting up a storm to get ready. During today’s “Take Five & Company” craft segment (WZZM Channel 13 in Grand Rapids), I showed a couple birthday projects I’ve been working on. I’m still working on the birthday banner, so I’ll post those instructions after I’m done. 1) Cut out the template and pin to a double layer of felt. Cut out a total of two felt crown shapes. Use the same template to cut one piece of interfacing. 2) Embellish the front of the crown. Make a felt star or heart patch to stitch to the front of the crown with embroidery thread, or use sewing thread to stitch sequins to form your child’s first initial. Pin a ribbon to the bottom edge of the crown and machine sew across the top of it. 3) Once the embellishment is complete, assemble the crown sandwich placing the piece of backing felt right side down, followed by the interfacing and then the front panel right side up. Machine sew along the top and bottom of the crown, leaving both sides open. 4) Tuck one end of the elastic between the interfacing and bottom layer of the crown. Pin. Stitch down the side of the crown, careful to catch the elastic in the stitching. Repeat to secure the elastic to the other side. Congrats! 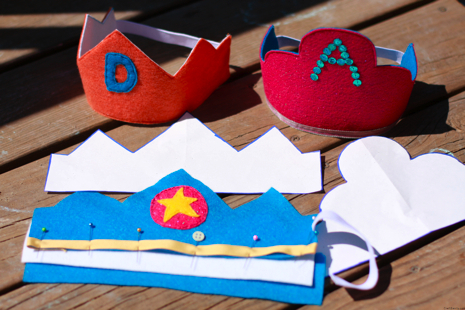 You just made a crown fit for your little king or queen. Okay, I better get back to stitching the rest of the stuffed felt, “Happy Birthday” banner. I’ll post a photo as soon as it’s finished. craft tutorialcrafting on TVfelt birthday crownsproject instructionsWZZM "Take Five & Company"